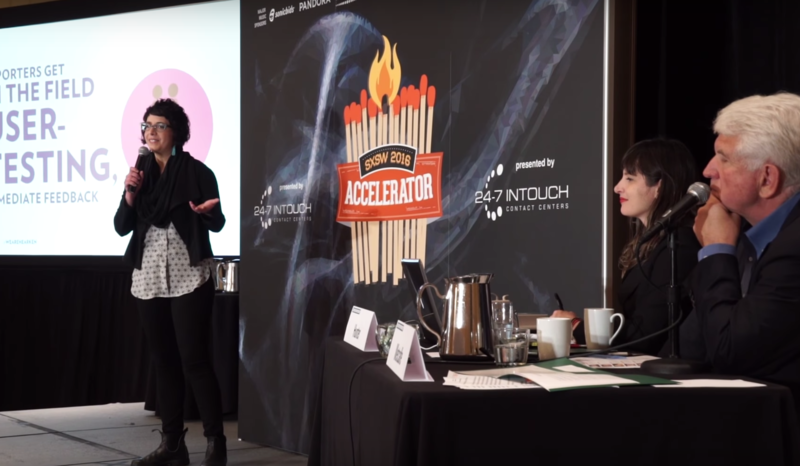 The ninth annual SXSW Accelerator Pitch Event kicks off tomorrow, March 11, at 9:30 AM. in Salons A & B on the 4th floor at the Hilton Austin Downtown. To accommodate the explosion of technological innovation over the past year, four categories have been added to this year’s competition. Fifty companies from ten different categories will present new online entertainment products, the latest ideas in social business or personal networking applications, and innovative web-based technology services to a panel of expert judges. View the list of 2017 finalists and alternates. Tomorrow’s pitches will be from 25 companies in the following categories: Transportation, Social & Culture, Enterprise & Smart Data, Health & Wearable, and Innovative World. The competition continues on Sunday, again starting at 9:30 AM in Salons A & B. The remaining 25 companies will pitch from the following categories: Sports, Payment & FinTech, Security & Privacy, Entertainment & Content, and Augmented & Virtual Reality. The winner of each category will be announced at the SXSW Accelerator Pitch Event Award Ceremony at 7:00 PM in Salons A & B. The ceremony, co-emceed by Andrew Hyde, founder of StartUp Weekend, and Yiying Lu, creative director of 500 Startups, will include special awards for Best One Minute Speed, Best Bootstrap Company, and Most Innovative Company. If you miss the pitches you can still meet each of the 50 finalists at the Accelerator Demo Days on Monday, March 13, from 11:00 AM to 1:30 PM in Salon C at the Hilton Hotel. But that’s not all. New this year is a Super Accelerator Pitch Event at 5:00 PM on Monday in Ballroom EFG at the Austin Convention Center. All ten category winners will be invited back to the stage to pitch once again in front of a new audience and a new set of judges. This competition will select the 2017 Best Startup Pitch Company. We hope to see you there! Photo Courtesy of SXSW Accelerator.